A 28 year old guy in British Columbia thought it had some message about climate change if he sealed himself in a primitive biodome with 200 plants. But the sun didn’t shine, the plants didn’t photosynthesize enough, and he “felt sluggish”. CO2 levels were a bit high so he had to abandon the experiment just 15 hours later — calling it “a huge success”. As you would, if you had no connection to actual hardship, or actual success. The BBC thought this badly planned, unscientific stunt failure was newsworthy and lauded him his 15 seconds of fame and advertising for the cause. Proving that any kind of measurable achievement is irrelevant. If it promotes the religion, anything will do. 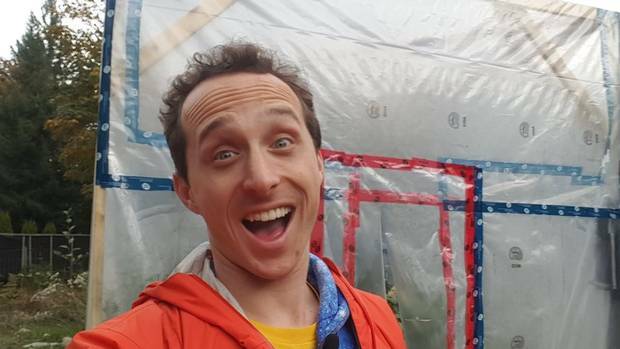 A self-styled “whimsical scientist” who locked himself in an airtight dome with 200 plants to raise awareness of climate change has ended his experiment. He thanked fans and described the experience as a “huge success”. While still inside the dome, he explained his mission in a Twitter thread, writing: “#ClimateChange is real, we’re causing it, and it’s a real big deal. Hmm. He doesn’t say what his “abort” value was in ppm. So he pushed his body to withstand levels of CO2 that other people experience every day. Indeed “many” people. Give the man a medal. It is hard to find a bar set lower than that. It might mean more if he had half a lung, or was really an axolotl. Despite his three-day attempt falling short, Kurtis Baute says the message about climate change remains the same. Yes, the message about climate change is that the scientists who are drawn to it are publicity hounds who are not good with numbers. Plus the whole lack of a cause and effect thingy, or any reason for being, reminds us of the IPCC. “Congrats”. Canadian Kurtis Baute, 28, was living with around 200 plants inside the greenhouse to clean his air and provide oxygen – but a cloudy day in British Columbia limited photosynthesis, allowing CO2 levels in the chamber to rise. There is some poetry in him being foiled by clouds. It’s the only part of this experiment similar to climate models. “It did end sooner than I expected, but that’s okay,” Kurtis told the Press Association. Then just when you think the hype has peaked…. “Personally, this has totally changed my relationship with the air that we inhabit. “I literally used to see right through it, this fluid that we are immersed in 24 hours a day, but now I see that it is a literal life-force, allowing us to get energy out of our food. Join in the non-stop insights on twitter at #KurtisInAJar. BBC-funders. You need your money back.